Premium Leisure LLC, has teamed with Statement Marine to introduce a rare manufacturing combination: a fully functional hot tub inside a fully functional 50-foot powerboat ! The new Passion 50 boat features a Leisure’s Edge 742 hot tub in the engine compartment. The boat had room for the 84-inch by 84-inch by 36-inch spa because it runs off helicopter turbine engines. 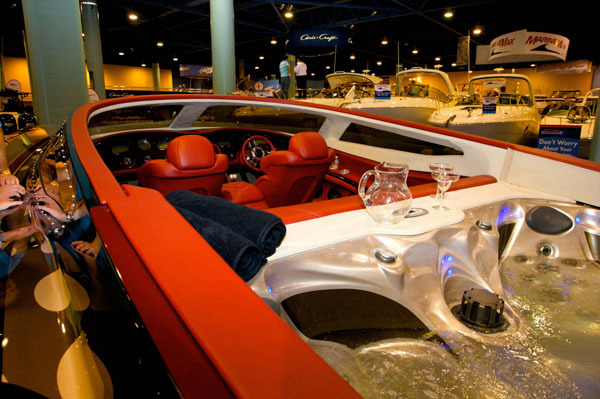 The boat/spa combination debuted at the Miami International Boat Show in Miami Beach earlier this year and reaches top speeds of up to 180 mph. It can be yours for $1.5 million. Premium Leisure LLC manufactures hot tubs/spas in St. Petersburg, Florida. President Brian Wiley has more than 32 years experience in the hot tub/spa industry and is committed to the success of the Premium Leisure LLC dealers and distributors. Premium Leisure has positioned itself as an a la carte manufacturer, offering some of the best designs (Leisure’s Edge hot tubs) and technology (variable speed hot tubs and turbine propelled swim spas) in the industry.